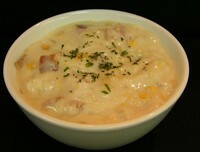 In a large crock combine 2 quarts Foothill Farms Cream Soup Base, corn and cooked bacon. Stir until well blended and let sit. Sauté or steam onions until translucent. Add onions and cooked potatoes to crock and stir to combine. Heat to 165° F and stir prior to serving. Bacon grease may be added to the mix for enhanced flavor, if it is available. NOTE: Note: Foothill Farms Cream Soup Base (Crème Potage) yields 1 gallon of base. This recipe uses 2 quarts. Store remainder tightly covered in refrigerator for up to 5 days.